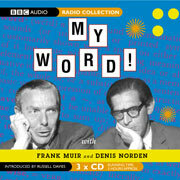 With your hosts Frank Muir and Denis Norden. This was a radio show that may have saved my sanity while I was existing in Muncie, IN. (A book was written about Muncie. It was entitled “Middletown in Transition: A Study of Cultural Conflicts.”) They began together on the show in 1956 and made us laugh out loud for the next forty-three years. My Word! was “Light Weekend Entertainment” at its best. The show required the contestants on the panel to ansswer qustions about the origins of words and in the end, to weave a story around a well-known phrase.My Word! Confession is Good for the Soul. is a typical example of the urbane charm and erudite fare that awaited the listener at the end of each episode. It was a different time. (You can hear it in the sometimes plummy Oxbridge accents, particularly Muir’s, who can’t quiet pronounce his “r’s.” He would have said: “phroe-nounce.”) But what a time we had. Give a listen and make a note to be exceedingly sophisticated and witty at your next cocktail party. This entry was posted in Elegantology, Entertaining and tagged books, Elegantology, radio, wit. Bookmark the permalink. 8 Responses to My Word! Don’t forget My Music! That was the best part about living in the UK… all of the amazing radio productions. I loved The Book at Bedtime and the Shipping Report. That really helped my geography. My Music! Always fun! And they even sang. That’s guts. I didn’t get The Book and Shipping Report on local NPR…. But it sounds like I could have used them…. i listen to them on the bbc online. http://www.bbc.co.uk/weather/coast/shipping/ i would lie in bed listening to the announcer work around the british isles… viking, cromarty, forties and forth… fair isle, faroes, s.e. iceland… take a listen. The panel shows are full of clever Brits who put their American counterparts to shame. In fact there is nothing quite as nice as being able to “tune in” to BBC Radio 4, with its programmes on books, its afternoon plays, and its “Books at Bedtime”. Old fashioned radio is alive an well~across the pond. TW- thanks for the link! A great idea in cultural exchange — ours for theirs, every once in a while, anyway. programmes that might have been missed. Their website is brilliantly coherent. I remember driving Sunday mornings and listening to this and ‘My Music’ in the 90’s. Thank you so much for the link!